September 16 - St. Cornelius, Pope and Martyr - Memorial - My Catholic Life! The twenty-first pope of the Church, Saint Cornelius, succeeded no one. After the death of Pope Saint Fabian, martyr, in January 250, persecutions prohibited the clergy of Rome from electing a successor, so the chair of Saint Peter was vacant for over a year. Finally, when the cruel Emperor Decius departed Rome on military campaign, the clergy chose Cornelius as Bishop of Rome. Not everyone was happy with the choice, especially the former future pope Novatian, who had led the Roman clergy during the vacancy and had convinced himself that he was going to be elected. Novatian’s supporters consecrated him bishop and refused to acknowledge Cornelius. Sides were taken, letters were written, and tensions heightened. After consolidating support from the esteemed Saint Cyprian, Bishop of Carthage, and others, Cornelius resolved the dispute by convening a synod of bishops which excommunicated the schismatic Novatian and his followers. Pope Cornelius reigned for a little over two years, from March 251 to June 253. Even though his time in office was brief, he made some important decisions and left an interesting legacy. Decius’ persecution gave rise to the greatest pastoral dilemma of the third century—how, and whether, to reintegrate those Christians who had offered pagan sacrifice and who subsequently desired to return to the embrace of Mother Church. The related question of whether bishops, priests, and deacons who had apostosized could perform valid sacraments would vex Cornelius’s successors. There were two camps on this issue. Novatian held that lapsed Christians were idolaters and idolatry was, in the Old Testament especially, unforgivable. The Church could not absolve such apostates. They were to be judged by God alone at death. Cornelius, Saint Cyprian, and other bishops occupied a more moderate position. They taught that the lapsi could be reintegrated into the Church through repentance and an appropriate penance. Cornelius’ position won the day, forever and always, establishing an important theological precedent: There is no sin that cannot be forgiven. Pope Cornelius also left, in his letters, an important record of the size, state, and organization of the Church of Rome, hard facts so often overlooked and thus unreported in historical documents. Decius’ successor as Emperor was named Gallus, and he was no friend of Christians either. He banished Cornelius to a city not far from Rome where the Pope died of physical hardship. He was buried near the papal crypt in the catacombs of Saint Callixtus. One day in 1849, an amatuer archeologist, a layman who worked in the Vatican library, found a small marble shard that read NELIUS MARTYR in a field on the outskirts of Rome. But there was no martyr named Nelius. He then found another shard that read COR. The inscription is still visible today in the catacombs of Callixtus: Cornelius Martyr. The Romans unsheathed their long knives in the 250’s. Pope after pope was martyred. Yet the Church did not run and hide. It stayed and grew. Its leaders knew how to die, and the faithful were emboldened. 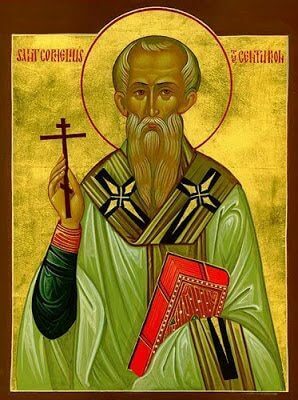 The blood of Cornelius and other pope-martyrs wet the soil, and the seeds of faith moistened, grew, and sprouted into the vast garden of Catholicism that slowly, and imperceptibly, took deep root in the ground of Europe. Saint Cornelius’ name is read at Mass in Eucharistic Prayer I even today, next to Saint Cyprian’s. He was staunch in his defense of the Church he died for, yet appropriately lenient to his fellow Christians who did not possess his same fortitude. In this respect, he was as wise a pastor as he was brave a martyr. Saint Cornelius, our Lord said that it profits a man nothing to gain the whole world if he would lose his own soul. You gained the papacy, not the whole world, yet gave it up rather than bend to the will of the Church’s enemies. Help us to persevere like you. Cornelius, bishop of Rome, to whom eight letters of Cyprian are extant, wrote a letter to Fabius, bishop of the church at Antioch, On the Roman, Italian, and African councils, and another On Novatian and those who had fallen from the faith, a third On the acts of the council, and a fourth very prolix one to the same Fabius, containing the causes of the Novatian heresy and an anathema of it. He ruled the church for two years under Gallus and Volusianus. He received the crown of martyrdom for Christ, and was succeeded by Lucius. 1. Bishop 251, died 252. 2. Fabius. Some mss. Fabianus. From Lives of Illustrious Men I, St. Jerome, Chapter LXVI.